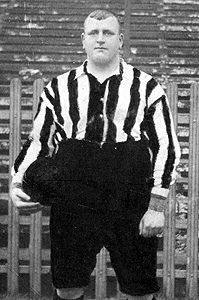 • William Foulke born at Old Park, Dawley, became a professional goalkeeper and cricketer with a height of 6’6” and weight of up to 25 stones. • Joined Sheffield United FC at age of 19 and won FA Cup winners’ medals, a league championship medal, and a full England cap. • In 1905 he joined newly-formed Chelsea FC for £50. His last club was Bradford FC. • A talented sportsman, he also played cricket, including 4 first-class matches for Derbyshire in 1900. • He became increasingly obese and temperamental. He retired from the game in 1907 and died aged 42.